Only words but no action. That sums Algeria’s attitude towards any initiative to reinvigorate the Maghreb. Algeria, which maintains borders closed with Morocco despite calls from Rabat to normalize relations, went further in its obsession of containing Morocco by adopting self-defeating strategies in the Sahel. Governing behind the curtain of a dead-living president, the deep state in Algiers has seen in Morocco’s economic inroads in West Africa a threat to their hegemonic ambitions. After squandering the country’s petrodollars during the era of expensive oil, the rulers in Algeria cannot explain to their ordinary citizens how Morocco, without oil and gas, has an active private sector that is a key actor in the country’s economic diplomacy across the continent. They instead persist on maintaining a rent economy and a foreign policy pegged on the price of the barrel. When the price is up, handouts domestically and abroad increase and when it is down, social peace at home is at risk while diplomacy fanes. An illustration of Algeria’s inability to compete with Morocco is the decision to open a border crossing with Mauritania with the aim to export fruits and vegetables to the desert country that imports the bulk of its food needs from Morocco. 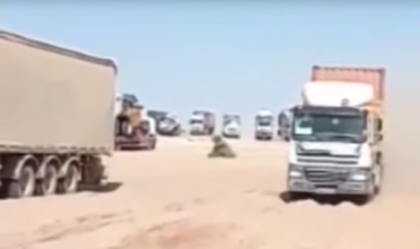 The Algerian press voiced the concerns of Algerian truck drivers and agricultural operators who have stopped exporting fruits and vegetables to Mauritania due to the long distance that can span 3500 kilometers, bad quality of road but most of all the expensive price of diesel which was not offset by state subsidies. Only few weeks after the opening of the border crossing, Algerian fruits and vegetables could not compete with Moroccan produce, which are exported from the agricultural hub of Agadir through the road that crosses the Sahara. In two days, fresh products from Agadir can be sold in the markets of Nouakchott making it hard for Algerian exporters to compete. Not to mention quality in Morocco which has a far more advanced agricultural sector than Algeria. Before trying to compete with Morocco, Algeria has first to proceed to domestic reforms to boost private investments and promote free competition which is only conceivable as part of an integrated regional grouping, the Maghreb.